What??? No really… I think it could be good. However I couldn’t find any recipes out there so maybe it’s a bad idea! My friend Maureen told me the other day she made Chicken Parmesan and that sounded so good! But two things… 1. I don’t have any fresh cheese in the house and 2. 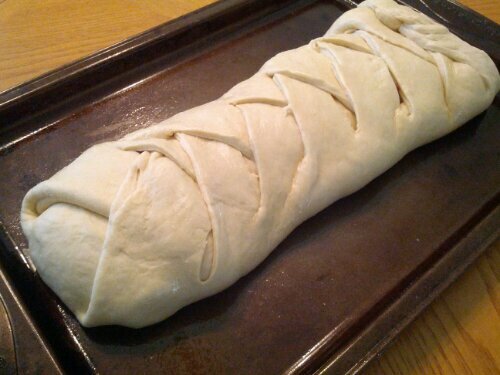 I was itching to make something with yeast dough. As far as cheese goes, I DO have grated parmesan and while I don’t really like that kind of ‘cheese’ very much, I have found it’s actually pretty good if you make a bechamel sauce with it. So… I decided I’d fry up some chicken tenderloins in Italian bread crumbs, toss them with spaghetti sauce and then put a layer of Parmesan garlic bechamel sauce over it, all wrapped in a lovely dough!